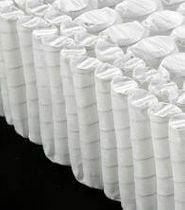 This TwinXL (38 x 80) features 772 individually wrapped high strength coils with double edge support and lumbar support under a 3" Natural Talalay or Natural Dunlop topper. Full size (53 x 74) has 1034 coils. There are actually 3 wire gauges in the QE Combi-Zone®. 16g narrow diameter perimeter coils. 17g narrow diameter coils through center 1/3 and 14g larger diameter coils on both sides of center 1/3. Now offering Slow Recovery Latex for those who like the memory foam feel but with none the off gassing and chemicals. 3" toppers come in Plush #20-24 ILD, Medium #25-29 ILD, and Firm #30-34 ILD. Slow Recovery Latex option is #20-24 ILD. This mattress finishes a little over 12" thick and is an excellent choice for Adjustable Bed bases.